To love is to know God, and thereby find our own identity, purpose and meaning. Unlocking all these treasures, begins with a decision! Providing spiritual enrichment and charitable functions within our facilities, as well as the surrounding communities. Sanctuary Health Network and our Faith-Based senior healthcare campuses have partnered with Fullness of Truth, a non-profit Catholic evangelization ministry. 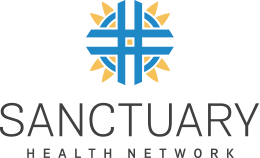 Charitable giving is at the core of Sanctuary’s corporate strategy. Sanctuary is keenly aware of both the therapeutic advantages and spiritual well-being enjoyed by its residents when enveloped in a culture of faith. Sanctuary’s Faith-Based healthcare campuses welcome “with open arms”, according to centuries old Catholic tradition, residents of all faiths to experience a unique oasis of physical and spiritual well-being designed especially for seniors. Yes! I have made the decision to show my Love for God by helping my brothers and sisters under the care of Sanctuary Health Network. Fullness Of Truth enlivens and feeds the soul. A comprehensive schedule of Mass and Christian worship services, confession, rosary & prayer services, scripture study, religious TV programming, and counseling. Also offered are many spiritual enrichment programs for residents and their families, such as the God’s Embrace Program. Fullness Of Truth facilitates community outreach efforts to nearby religious communities. Private or small group workshops with families/spouses on the proper coordination of senior healthcare services on a case-by-case basis shall be regularly offered, in addition to larger scale, community-building events at Sanctuary facilities and nearby churches/parishes. The heart and soul of any Sanctuary Faith-Based, senior-living campus is its chapel. In fact, the spiritual well-being of our entrusted residents is so central to Sanctuary’s vision and mission, that we actually design our new campuses around suitable chapels for Divine Worship and prayer. Fullness Of Truth shall lead charitable-giving, fundraising efforts necessary for the construction, maintenance and staffing of our beautiful chapels at both existing and newly-developed facilities. Fullness Of Truth is orchestrating non-profit development campaigns for the construction and/or maintenance of specially-designed Priest/Clergy Retirement Homes and ancillary facilities, for the provision of their ongoing living and health care necessities. Comprehensive design of attractive and tasteful spiritual décor throughout our facilities. Fullness Of Truth shall maintain a library of classic and contemporary spiritual works in audio, video, and book formats, with the creation of small, yet well-appointed spiritual gift shops in each of the facilities. FoT may serve as a critical resource. For funding for residents financially stressed because of past medical expenses, or are awaiting Medicaid benefit eligibility, or find themselves somehow alienated by their family and unable to pay their portion of ongoing healthcare services, Fullness of Truth may serve as a critical resource for subsidizing such costs via its non-profit endowment after thorough investigation of each case. Only by openness to such charitable relief, can Sanctuary truly fulfill its sincere corporate mission of providing truly Faith-Based senior healthcare in harmony with Catholic moral tradition. For providing a non-profit, authentic Catholic Hospice, strictly adhering to the Ethical & Religious Directives of the Catholic Church. Insisting on the close governance of Sanctuary’s BioEthical and Spiritual Advisory Boards, Fullness Of Truth will always staunchly protect the sacred value and inherent dignity of human life in all end-of-life situations. To help grasp that reality of sacredness found in those final hours, a “No One Dies Alone” ministry comprised of local clergy and lay volunteers shall be available and fully responsive as well.